When it comes to fitness, we all talk a lot about cardio and strength training while ignoring a huge part of overall health—flexibility! Stretching will not only make you limber, it can alleviate back pain and improve your posture. Not sure where to begin? Take a tip from physical therapist Jason Whitman, owner of Positive Physical Therapy in Santa Monica, California. Whitman created this stretching routine that can improve your fitness and better your health. Get into a wall sit position (squat with your back against a wall) and rest your arms against the wall with your elbows bent at 90 degrees. Bring your shoulders back, and retract your shoulder blades trying to touch them together. Keeping your shoulder blades together, move your arms up and down the wall. Wall angels strengthen your scapular retractors—the muscles between your shoulder blades—and they also work your chest muscles and core. Lie on your side, placing your top knee on a foam roller next to you. From this position, take your top arm and windmill it over to the opposite side, opening up your chest and touching your back shoulder to the ground. Remember to keep your knee on the foam roller the entire time. After stretching one side, switch to the other. This stretch helps your thoracic mobility, reducing stress on your lumbar and cervical spine regions. Get into a tabletop position placing a Swiss ball between you and a wall. Push your glutes back into the ball, and extend your right arm out in front of you. Hold for 10 seconds before switching arms. This stretch will activate your core, teaching you to engage your core while keeping your spine neutral. 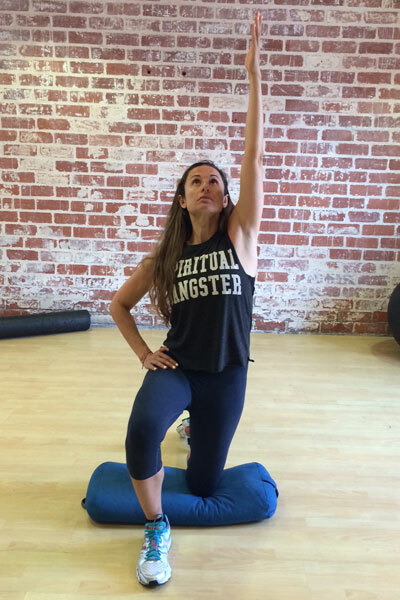 Get down on one knee in a resting lunge position. Engage your abs and push your hips forward, raising your arm (the one opposite your front knee) above your head. Sink into the stretch. The hip flexor stretch helps relieve lower back pain while loosening up your hips. For this stretch, you will need to use a TRX band or a heavy resistance band wrapped around a pull-up bar. (If you don't have a resistance band, try using a door jam like I did here.) Holding both straps, sit back so that your arms are fully extended. Leaning forward, twist your torso to the left so that you are looking under your left arm. Next, step your left leg behind you and over toward your right side. Hold this stretch, and then switch directions. This stretch allows your scapula to rotate upwards, and increases your range of motion. Looking for more ways to stretch? 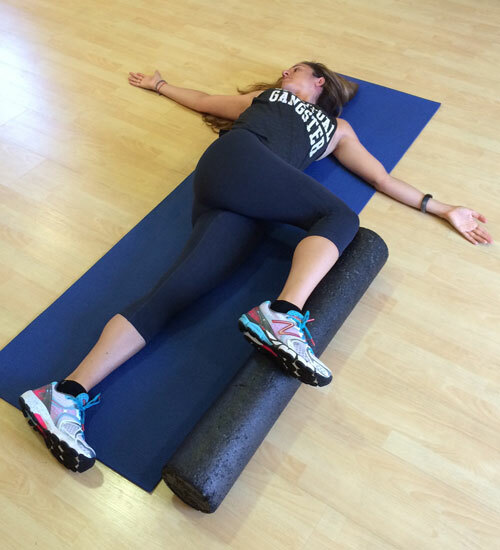 Check out 4 Things You Need To Know About Foam Rolling.